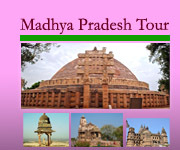 Morning visit the world famous Sanchi stupa (world heritage site), then to Udaygiri rock cut cave (5th c AD, Gupta period, return back hotel, lunch and then after noon visit the city sightseeing of Bhopal. Jama masjid, Moti masjid and Gohar mahal in chowk area. Overnight at the same hotel. Morning after breakfast drive towards to Mandu. Upon arrival at there check in a nice hotel on the side of lake. Afternoon visit the eco point and Baz Bahadur and Rani Roopmati palace. Morning while boating on the river Narmada, view the activities on the river ghat. 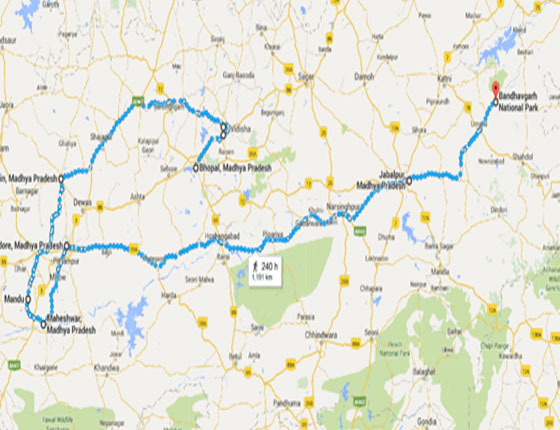 Visit the Maheswar and kaleshwara, Rajarajeshwara, Ahileshwar temple then after lunch drive towards Indore to board the night train for Jabalpur. Upon arrival Jabalpur check in hotel at Bhedaghat on the bank of river Narmada. Jabalpur: – Pleasure resort and 12th century capital of the Gond kings and later the seat of the Kalchuri dynasty.Morning boat ride on Bhedaghat: Soaring in glittering splendour, the Marble Rocks at Bhedaghat rise to a hundred feet on either side of the Narmada as it flows through a narrow gorge. 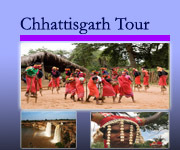 Also visit the stunning Dhuandhar Falls and the Chausath Yogini Temple. Overnight relax at the same hotel at there. Departure for Bandhavgarh, check in a nice clean and comfort jungle resort at there. Bandhavgarh: Tiger –spotting is virtually guaranteed at Bandhavgarh as it has the highest tiger density in India. This is where the Maharaja of Rewa found the world’s first white tiger. More than twenty-two species of mammals and 250 species of birds can be found here. Meet the wild tiger and also other herbivorous on nature while jeep safari in the early morning and afternoon (please consult with your guide). Overnight in the same resort. Morning again one jeep safari in the core zone of Bandhavgarh. 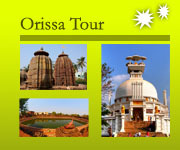 Then after lunch drive to Khajuraho and evening check in the nice hotel and relax. If time permit visit the light and sound show at the western group of temple or classical dance programme at the auditorium. ( both are chargeable). 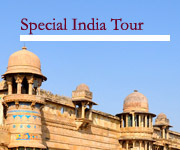 Morning excursion the language of stone on western group of temple at Khajuraho and explore the ancient visual Kamasutra on temple wall and also visit the eastern group of Jain temple. Afternoon board the flight for Delhi, then to your onwards journey.